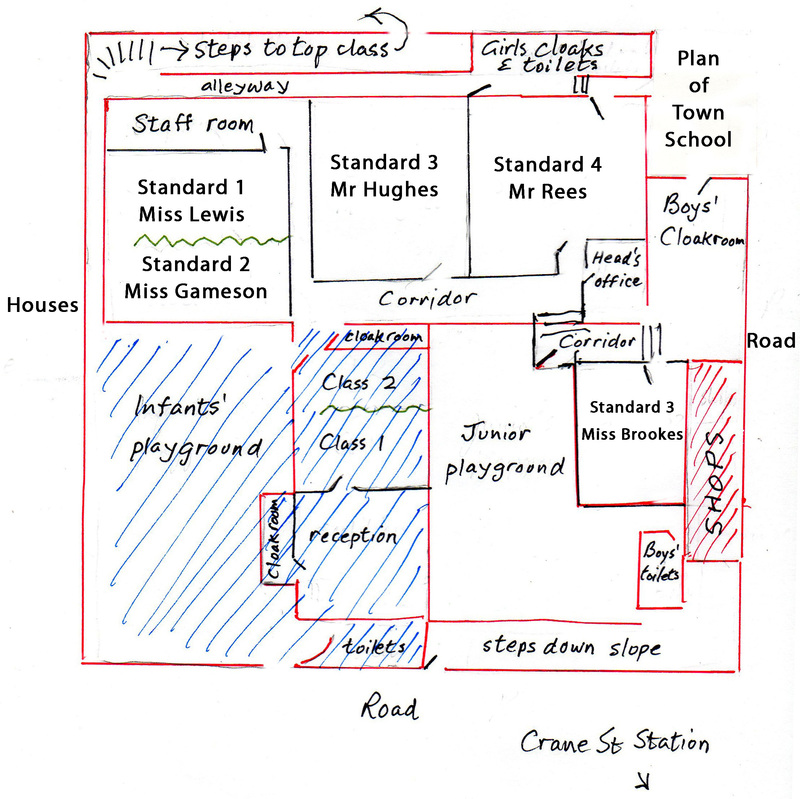 As I said in my last post, I would be publishing a plan I have made of the main building of Town School. As the Scholarship Class was housed in The Bungalow and separated from the main building, I have left it out. This is based entirely on my memory of the school about 75 years ago so I don’t make any claims about its accuracy. The whole of the Infants’ section I have hatched in blue. I was taught by every teacher with the exception of Mr Hughes. I went straight from Miss Gameson’s class to Miss Brookes’, hence I am assuming that there were two standard threes. Then I went into Mr Rees’s class and then to Mr Petty’s for two years. If any visitors have different memories please make a comment or email me. It’s quite possible that there were not two standard threes; I can see no reason for it. I did the plan by hand so it’s not a classic and it is certainly not to scale. If anyone has an architect’s plan of the school, which was built in 1838 that would be wonderful. Town School class photograph. Do you recognise anyone? I recently received an email and a photograph from Clive Barnby. The email and photograph are self-explanatory so I publish both below. If you have any comments please feel free to make them. I will publish another post soon after this one which will include a plan of the main Town School building as I remember it. “I wondered, David, if you are able to put this photo on your blogsite. It’s from Graham Newman, who lived in Gwent street, was in school with me, saw my name on your blog & remembered me. 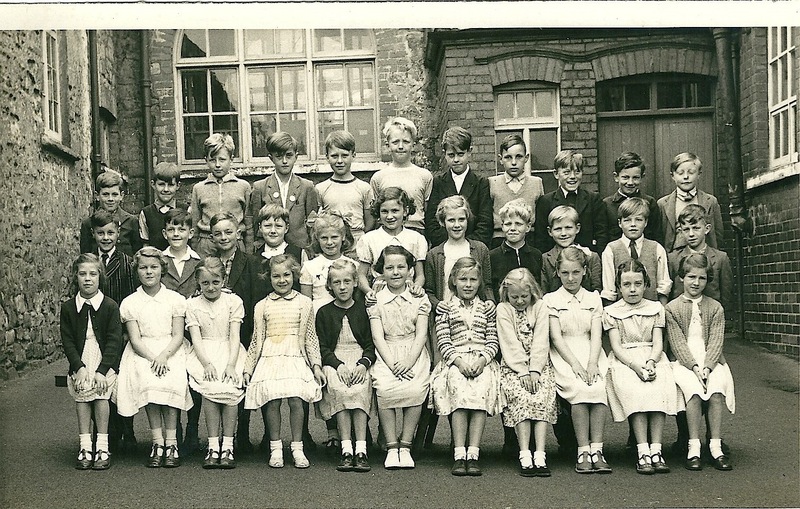 I think the picture was taken in 1955/56 – we would all have been born 1945-47.It is of Standard 3 even tho’ the picture was taken in the infants playground. If I’m right, the teacher was Mrs Hughes, formerly Miss Brookes, but for some reason she is not in the picture. Graham (Newman) is in the back row, first left (as you look at the photo), I’m next but one to him (can’t name the lad between us); continuing from left to right is Andrew Neat from Haden street, who was tragically killed in a road accident many years ago, then Nigel Gordon, John Pope, son of Les, the butcher, then I think Michael Browne. I can’t name the next three but on the right is Brian Hale. In the middle row on the left is Graham Baldwin, then John Jones, ? , fourth left is (I think) Bernard Rootes, then Diane Pask, something Goodchild (the tall girl) can’t name the next girl, then ? Michael Pearce, can’t name the last three. In the front row, on the left is Carol Rowlands, then Jackie Gibbon (now Fitzgerald) & the only other one I can name is Jackie Miles (now Law) who is second from the right.